Billed as an “art lover’s paradise” by festival organizers, Art On The Greene has been bringing a top-quality art show to the Arlington Entertainment District each spring for the last six years. One aspect that sets the show apart from other art festivals, according to festival founder Steve Moya, is the distraction-free nature of the event that allows guests to really spend quality time looking at art and getting to know the artists. Two: It’s happening Memorial Day Weekend. 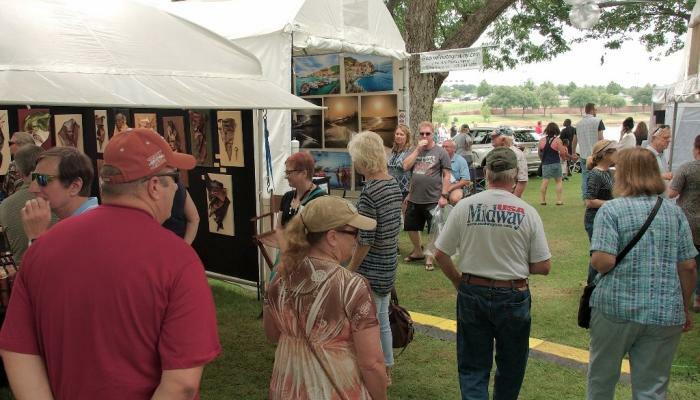 Like the name suggests, this festival is packed from top to bottom with art in a range of mediums—in fact, more 75 artists are expected to showcase their wares at this year’s festival, with many of them returning from previous years’ events. You never know, this just may be the weekend when you FINALLY find that just-right piece of art to pull your entryway together, or a fantastic piece of jewelry that’s perfect for your next special occasion. Art on the Greene categories for 2017 include: ceramics, drawing, painting, photography, printmaking, fiber, glass, jewelry, leather, metal, sculpture and wood. Four: There are tons of other cool things to do and see nearby. The festival’s venue, Richard Greene Linear Park, is one of the prettiest green spaces in town, with lots of great views of Globe Life Park and the Arlington Entertainment District. You can bring a blanket and enjoy some festival grub along the banks of Johnson Creek (see Fact Six below), check out the park’s stunning Caleum Moor sculpture garden or public art installations, or head out before or after the event for a nearby activity, such as: a behind-the-scenes tour of Globe Life Park or AT&T Stadium, shopping at Lincoln Square, a visit to the International Bowling Museum or a blockbuster flick at Studio Movie Grill. Five: Love live music? You’re in luck. There’s nothing like some groovy tunes to soundtrack your art shopping! Not only will live music play all day long during Art On The Greene, there’s also a fabulous show planned for each evening/late afternoon—and best of all, each concert is free! Friday, beginning at 4 p.m: Johnny D and the Cadillacs (blues, rockabilly, classic rock); Wow U2 (a tribute to U2); Rock and Roll Over (a tribute to KISS). Saturday, beginning at 2 p.m: Even It Up (a tribute to Heart); Forever Mac (a tribute to Fleetwood Mac); Cool As Ice (a tribute to Foreigner); INTXS (a tribute to INXS). Sunday at 3 p.m: Aurora Bleu (Vintage Americana – jazz, blues, swing). Six: You might want to arrive hungry. When you’re ready to re-fuel, you’ll have plenty of tasty choices, including burgers from Grease Monkey, kettle corn, Cajun fare (including fried gator! ), gyros, candied apples and other sweets, and much more. Seven: Art on the Greene has a cool backstory. Plan to spend some time at the event if you’re interested in buying art. It will take a while for you to visit all of the artists’ booths. Strollers and well-behaved pets on leashes are welcome. Please be prepared to clean up after your pet. Wear comfortable shoes and attire that’s suitable for the temperature outdoors. Bring lawn chairs or blankets for the concerts or picnicking. Cynthia is Texas born and raised with a slight detour to Kansas in between. She is a proud mom to a beautiful and talented pastry chef, so they are always stirring up something delicious at their home in Arlington. She is wild about sports and music, and she loves to attend concerts so she can sing along at to her all-time faves…80’s (the music is awesome…the fashion, not so much) and classic country. She’s a lifelong fan of the Dallas Cowboys and also loves college football; she cheers for both TCU and K-State (they are both purple, so that makes it ok, right?). She also has 3 fur grand babies…. sweet little Shih Tzu’s and a mini Maltese, Max, Zoey and Riley who are often seen dressed in costumes; yes, she’s that pet grandparent!